The woman is a safety officer for the food center where this stall is located. She spots some black marks on the wall between the glass showcase for the food. 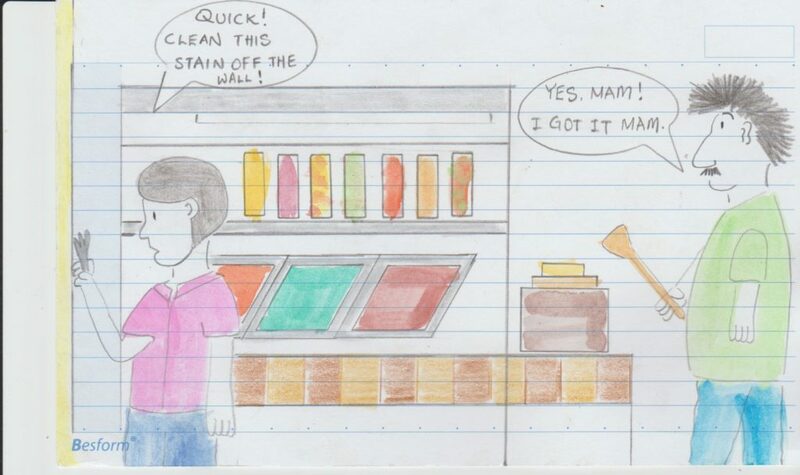 She tells the stall assistant to clean up the stains before the official health inspector comes. She takes a steel fork to try to scratch off the stain. The stall assistant grabs a ladle with a long handle, and a piece of kitchen cloth, to rub at the spot. While all this may seem to be extreme, the food handlers are paying heed to the recent rise in food poisoning cases in the area. Dirt, grime and bacteria multiply rapidly and the air becomes infectious. Mindful Doodles is a series of comic/ cartoon drawn on assimilating stimuli that comes into my mind. My surrounding and environment are dynamic. As events happen, the stimuli enters my brain and I pay attention to them. I am not mentally disturbed as I pay due respect to each stimulus. I ponder upon how I would deal with the stimulus, to manage the situation. I try to discover what lesson the Universe bestows on me in this encounter. I write my discovery as my Mindful Thought of the Day. Cleanliness is next to Godliness. Be mindful of your kitchen and places where raw food is handled.